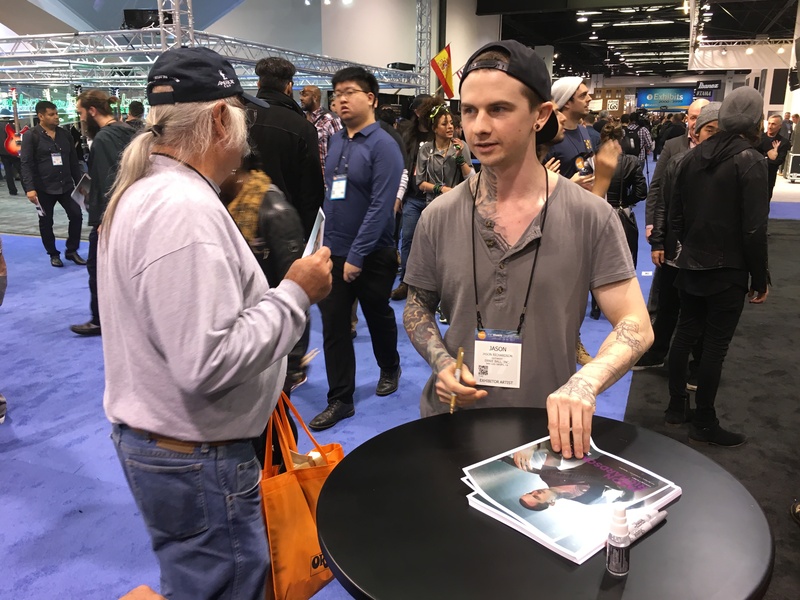 Click here to view our full NAMM 2017 schedule of Q&A sessions, performances and signings. John Petrucci showed off some of the finer details of the extremely limited edition Ernie Ball Music Man John Petrucci NOMAC Majesty guitar. Based on the NOMACs (Noise Machines) featured in the Dream Theater album “The Astonishing,” the guitar features real black diamonds, spinel rubies, white gold, LED lights, and many other intricate details. 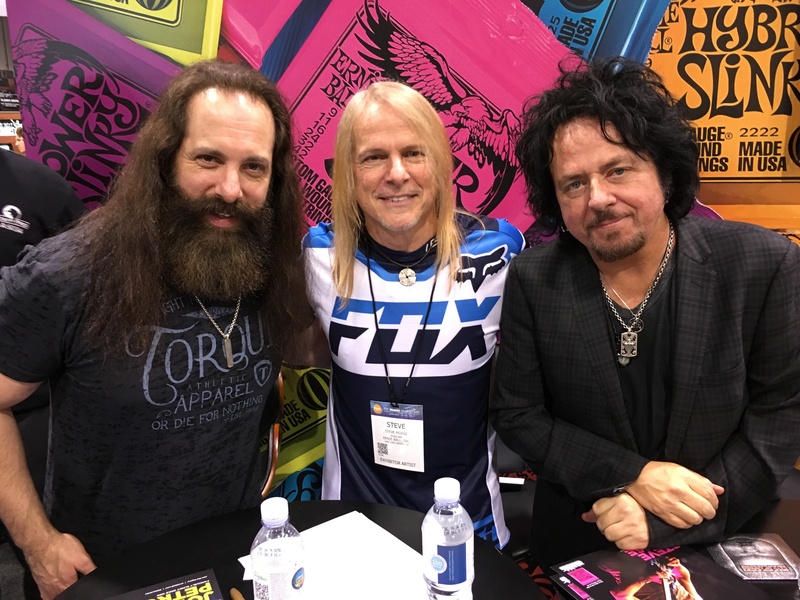 Shortly after the frenzy of Steve Vai’s visit, another fan favorite event took place: a true power trio signing session featuring John Petrucci, Steve Morse and Steve Lukather. Our biggest signing event of this year’s NAMM show took place today, featuring Steve Vai, Tony MacAlpine and Chris Broderick. The crowd was in a near-frenzy to get even a glimpse of these three incredible players together in one place. In fact, fans began lining up more than two hours early, and the line wrapped all the way around our very large booth. Vai stopped at one point to take a photo alongside John Petrucci, Steve Lukather and Sterling Ball, and the crowd in the booth went wild. Steve Lukather joined us in the booth today, and took place in a Q&A session with Sterling Ball and John Petrucci. Topics of conversation ranged from Steve coming to the realization of how Jimi Hendrix achieved his legendary tone, to the time he auditioned for Frank Zappa’s band as an up and coming guitarist. Dustin Kensrue and Teppei Teranishi, guitarists for Thrice, came by the booth to test drive some of our StingRay, Cutlass and St. Vincent guitars, as well as sign autographs for a sizable line of fans. 7-string shredder Jason Richardson hit the stage for a performance in front of a mesmerized audience. Jason Richardson plays various John Petrucci signature model guitars. Fans began lining up nearly two hours prior to the second signing session featuring John Petrucci and Steve Morse. This event was clearly a highlight of the show overall. Learn more about the Ernie Ball Music Man John Petrucci and Steve Morse signature guitars. James Valentine of Maroon 5 joined Sterling Ball on stage for a Q&A session, in addition to a jam session and autograph signing afterward. Learn more about the Valentine guitar. 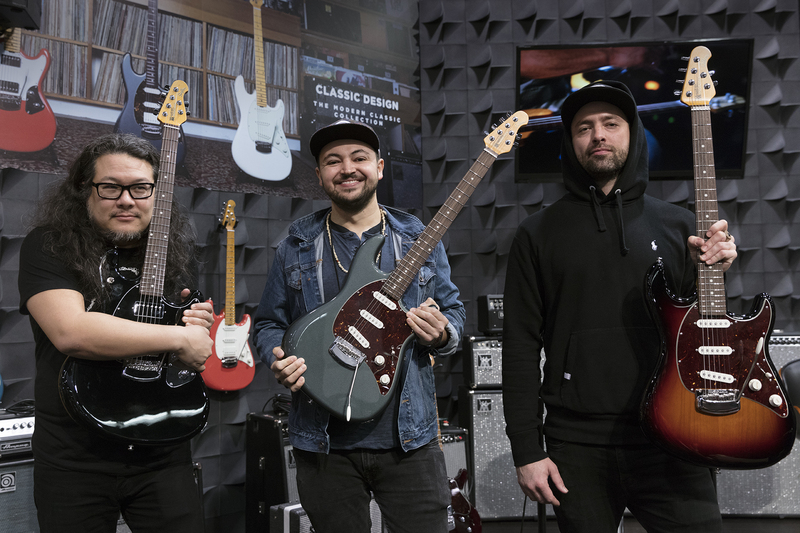 Guitarists Josh Carter of Phantogram, Bobb Bruno of Best Coast and Eli Maiman of Walk The Moon came by and checked out the Modern Classic series guitars, the Cutlass and the StingRay. Learn more about the Modern Classic series guitars. 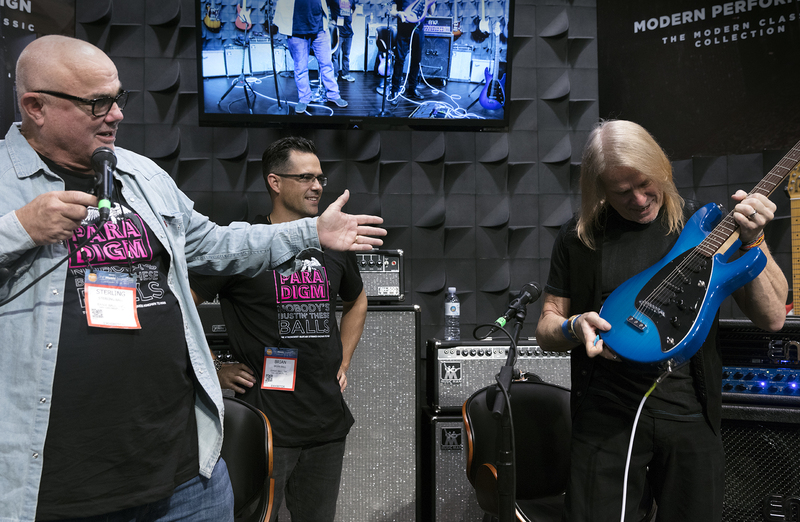 Day two of the show kicked off on a nostalgic note; in honor of the 30th anniversary of the original Steve Morse signature guitar, Sterling and Brian Ball presented Steve the second-ever guitar produced in the line. Steve still owns and plays the very first guitar made for the series, so Number One and Number Two were reunited today for the first time in thirty years. Learn more about the original Steve Morse signature guitar. Jason Richardson took the stage for a second time today, wowing the crowd with his seven-string acrobatics. Afterward, he signed autographs and took photos with his fans. 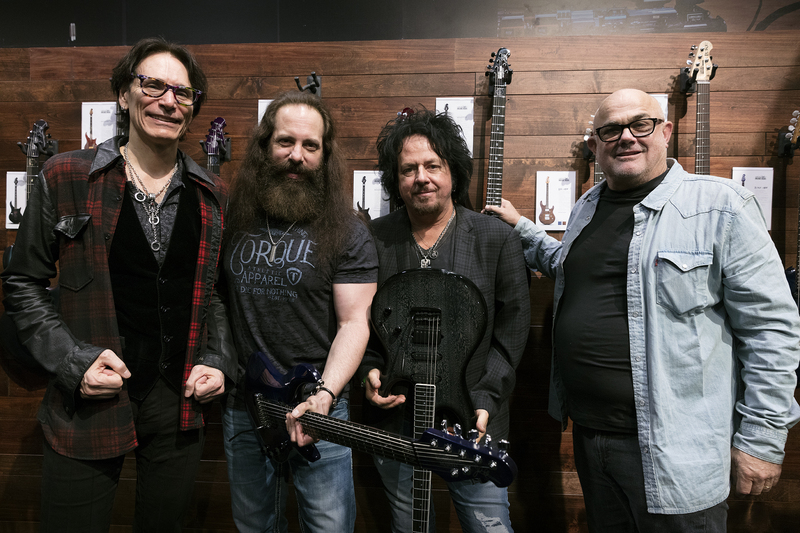 Sterling and Brian Ball presented John Petrucci with a Music Inc. “Product Excellence Award” for the Ernie Ball Music Man John Petrucci signature guitar collection. John Petrucci and Steve Morse sign autographs for their rabid fans, and subsequently create the longest line anywhere at day one of the 2017 NAMM Show. 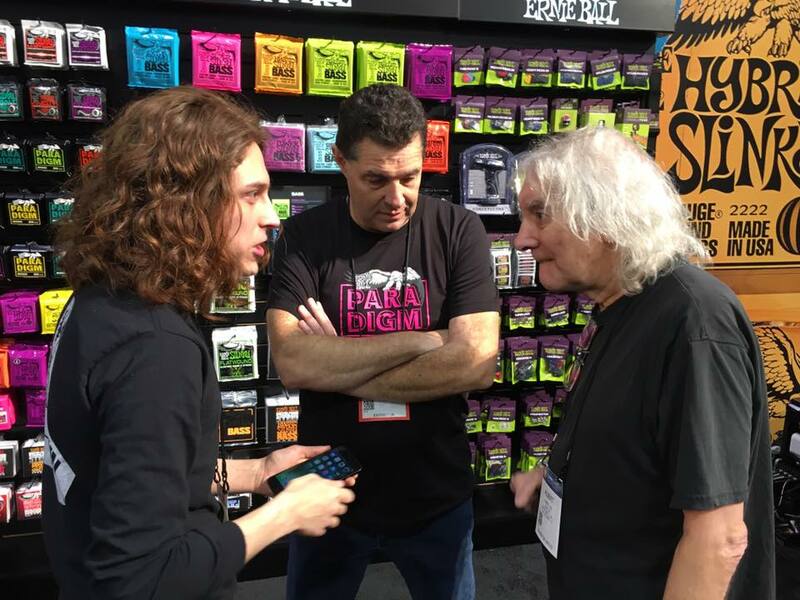 Albert Lee and Daniel Donato huddle up to plan their upcoming set. The jam is impressive to watch, as the two trade licks back and forth effortlessly. 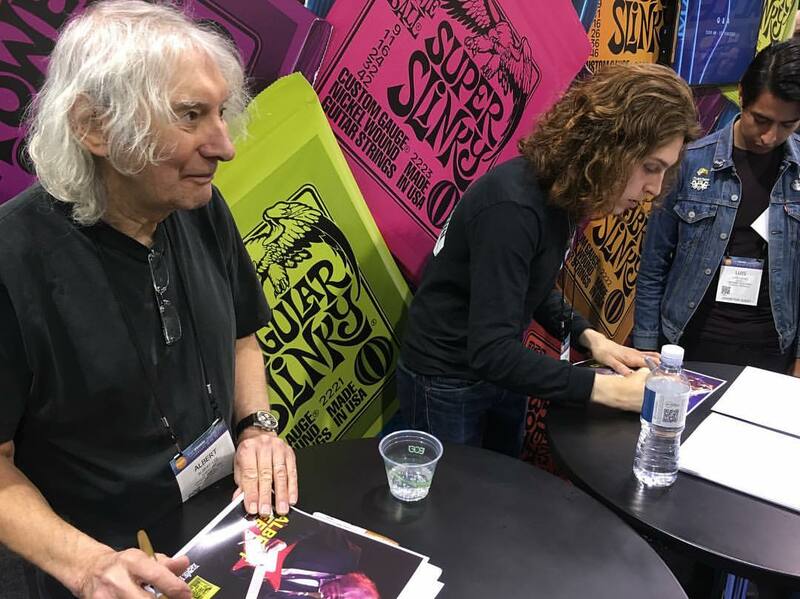 Following the jam, Albert and Daniel sign autographs for a line of eager fans. 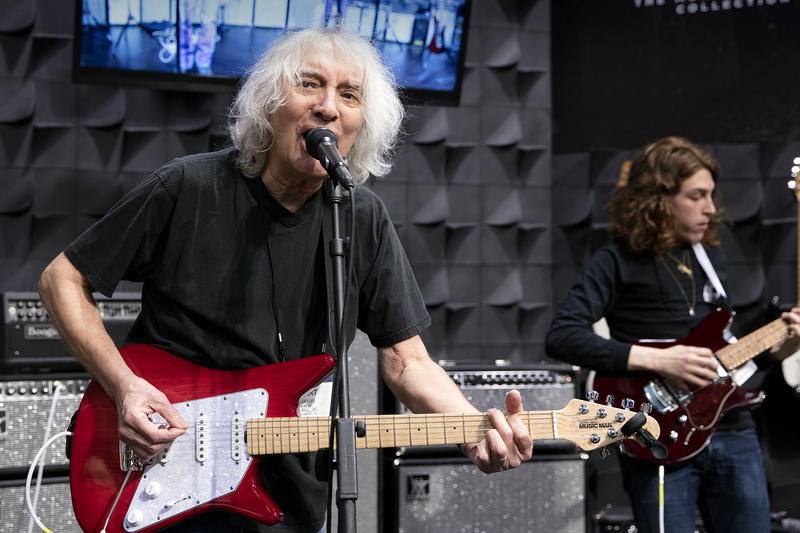 Learn more about the Albert Lee guitar and the Valentine guitar. We’re here in booth #5440 at the 2017 NAMM Show, and it’s already been an eventful few hours of Day One. Our morning kicked off with a visit from St. Vincent, who took part in a Q&A session with Sterling Ball, in addition to showing off her 2017 guitar collection.